Results of the second phase of the Side-Out Protocol (Side-Out II) were presented at the San Antonio Breast Cancer Symposium (SABCS), an annual meeting attracting professionals and patients from all over the globe. The mission of SABCS is “to provide state-of-the-art information on breast cancer research” and to serve as a “forum for interaction, communication, and education for a broad spectrum of researchers, health professionals, and those with a special interest in breast cancer”. Mariaelena Pierobon, MD, MPH, presented the results on behalf of the Side-Out Protocol research team. In simple terms, researchers concluded that the proteins expressed by the various tumors were dependent on the location of the metastasis (the spread of cancer from one part of the body to another), suggesting that the most effective drugs for a particular patient could be decided based on where his/her breast cancer spread. This also revealed that tumors that have metastasized to a certain part of the body share a distinct signature. Enrichment of PIK3-AKT-MTOR pathway activation in hepatic metastases from breast cancer. Results published August 2017 in Clinical Cancer Research. Protein Pathway Activation Mapping Analysis of Metastatic Breast Cancer Reveals Potential New Targets for Personalized Therapy. 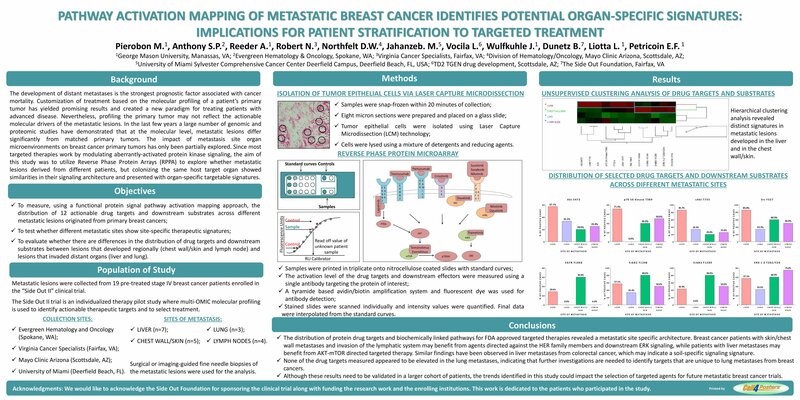 Pathway activation mapping of metastatic breast cancer identifies potential organ-specific signatures: implications for patient stratification to targeted treatment. The AKT-mTOR pathwat as a potential organ-specific drug target signature of hepatic metastases from breast cancer. Predictive value of topoisomerase 1 by immunohistochemistry (top1 IHC) in patients with metastatic breast cancer receiving irinotecan-based therapy. Androgen receptor activation in HER2-negative breast cancer liver metastases. A multi-omic analysis to explore the impact of “actionable” genomic alterations on protein pathway activation: clinical implication for precision medicine in metastatic breast cancer. Abstract featured by Elsevier PracticeUpdate Oncology. Quantitative measurement of PD-L1 expression across tumor types using laser capture microdissection and reverse phase protein. PD-L1 expression differs across cancer metastatic sites from breast tumors. The Side Out Foundation Metastatic Breast Cancer Database, an open-access portal for “multi-omics” molecular data and more. For more details about the trial or to learn about how to become a participant, contact Bryant Dunetz at [email protected] or 703-615-8740.